OK, so perhaps the headline’s hyping it up a bit — but isn’t that what the World Cup is about, hyping things up? 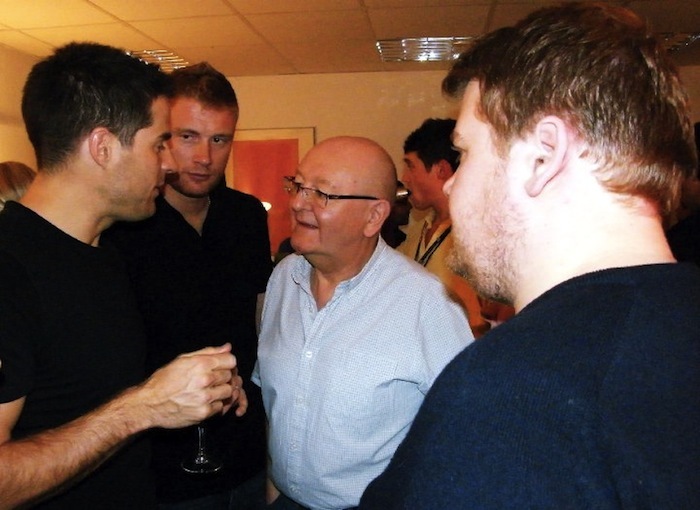 Being more of a Wimbledon fan myself, I’ll say no more and hand over to today’s special guest, the one and only (big round of applause please) … Mike Norbury! I know there is a fair percentage of folk who have had enough of the World Cup by now (regardless of England’s performance) but it may surprise many readers that there is a tentative link between our trade and ITV’s World Cup broadcasting. Well the reason for that is that the star of “Fat Friends”, Gavin & Stacey (which he also co-wrote with Ruth Jones), Horne & Corden, Doctor Who‘s recent episode ‘The Lodger‘ and now the hugely successful after match show James Corden’s World Cup Live is definitely the son of Malcolm and Margaret Corden. Not only that, Malcolm and Marg have been introduced on the show – Marg even taking part in a penalty shoot-out. Malcolm was asked by James on one episode [link to video excerpt below – Ed] if he was going to back the England team by not shaving until they won or were knocked out, which he could hardly decline in front of millions of viewers — at the Kevin Mayhew sales meeting last week he still wore the beard. At the 2008 Television BAFTAs, James won the BAFTA for Best Comedy Performance. Also Gavin & Stacey won the Sky+ Audience Award for Programme of the Year, the only award at the ceremony voted for by the public, beating The Apprentice and Britain’s Got Talent. Malcolm is well liked and respected on his territory and has previously won “Rep of the Year” which he was nominated for again this year. Prior to joining the Christian Bookshop trade he was a member of the Central RAF Band and James’s emotional story in the Daily Mail about his dad being sent to The Gulf brought many readers to tears. I know how proud of their son Malcolm and Marg are but it is very obvious from certain appearances on TV how proud James is of them. Loving a bit of sales rep spotting! Get your binoculars out folks! I am sure Malcolm is having huge amounts of fun and I have been praying for him and his wife (and I also spotted his daughter was having a chat on last night’s show!). Can you imagine if he gets the opportunity to share the Gospel to any of the folks he meets there! I wonder if anyone has had other rep citings in the past?! It’s a shame that James has turned away from the faith he was brought up with and all the negative stuff that he uses about the Christian faith in his work. Or perhaps it is the fact that he feels uncomfortable turning his back on Christ in order to gain popularity. Whatever it is we should pray for James that God would give him a fresh revelation of his love and power in his life. I am sure we all pray for the return of the prodigals. I also have a son James who is “doing his own thing” at the moment but I live in assurance that although he may have walked way from God for the time being God has never left him. I know it is a shame when our children who have given their lives to the Lord wander away like lost sheep but I learnt a long time ago not to be critical of him (nor, incidentally, of my other sons who never committed themselves). We must lift them up to God and pray for them but then allow God to do His job. Oh what great rejoicing there will be when the prodigals return!